Our pet cats are playful, they used to play rolling objects and other small toys such as pen cap, thimble, or bell. They are like curious about everything they see and trying to figure it out, can cause them trouble. If they saw something like toys or small object, they play and bite it. For that instance, that object can stock in their throat and cause them to choke. Aside from toys, their foods can also cause choking especially when they eat fast. They might not bite their food well which can result in choking. Choking is the cause for the cat to feel a hard time in breathing because something is in the trachea or larynx of the cat which prevents air to flow. It is a rare incident to the cats but it is life-threatening to them. How would you know if they are choking? As a cat owner, you will do something and help them to remove that thing in their throat. Here are the steps to remove the lodge in their airway. If you saw your cat removing something in his mouth and you can feel that he is not too upset. Go near him and if he didn’t move, try to grab him and look for the object he is removing. Hold your cat’s head with one hand, then the other will open the cat’s mouth. Use your thumb and index finger to open the cat’s mouth. If the mouth is already opened, softly pull the tongue out and remove the object with your finger or long-nose pliers. If you have removed it safely and the cat is fine, then you did a great job. Grab the back legs of the cat and hold him upside down. While shaking, slap the back of the cat softly to help to remove the lodge. If the lodge is removed slowly bring down the cat. Lay the cat on its side. Using one hand, place your thumb on the last rib on one side of the abdomen and the remaining fingers on the other side. Press your fingers together three to four times. Repeat until the object will be removed. 4. If none of the 3 ways can dislodge it, go immediately to the veterinarian. The cat should be layed on its side. Place your hand along his back. Put your other one on his belly, right below the ribs. Push the belly several times. Open the mouth and remove the foreign object. Close the mouth and give him a small breath through the nose. If you can feel that nothing is in his airway and he is breathing normally, just wait for him to wake up. Inline the head with the neck. Hold the cat’s head and blow safely into its nostrils. Control one breath every five seconds. Do it until you see the chest rise. If you saw the chest rise, stop and look if he can breathe on its own. If not, continue artificial respiration while transporting him to the veterinarian. If you feel that his heart is not beating, do cardiopulmonary resuscitation (CPR). Kneel down near the head of the cat. Hold the chest and let the breastbone rest in your palm, your thumb on one side of the chest and your fingers on the other. Your fingers and thumb should fall in the middle of the chest. Press your fingers together three to four times per second. Every 30 second alternately hold the cat’s head and blow safely into its nostrils. Control one breath every five seconds. Do it until you see the chest rise. You can check the heartbeat between the cat’s elbow and the center of its chest. Continue CPR while transporting him to the veterinarian. Those little four-legged friends are like children we have to be aware of what they are playing. And we have to be responsible for keeping the small objects away from them, for them not to suffer from choking or other problems that a small object can cause them. There are the steps on how to help your cat remove the object that causes him to have a hard time breathing. We cat owners should be aware of what is happening to our pets. If you cannot do the steps above on your own. Then all you can do is immediately bring your cat to the veterinarian. Because they are the experts when it comes to our pets. Our cats also serve as a stress reliever. They make us happy when we are sad and we are being entertained by them. But they also have this attitude that is annoying. They will climb anywhere they want. They jump into the cabinets. They keep on returning to the area where they should not go. And they have this habit of scratching their claws on the bed, sofa, or legs of the furniture. These little friends can be trained when they were kittens but it is hard if they are big already. So, what we need to do is to think of something natural and unharmful in preventing the cats to go in the restricted areas. Because even cats have those things they don’t want. We have this easy do it yourself solution or ways to prevent them from returning to the areas where they should not go. We only need to do is to put something in their favorite spot. The cats have superior smelling abilities. When you mix the vinegar and water, put it in a spray bottle then spray it to the area where you don’t want your cat to go. They don’t want the scent of the vinegar so when they have smelled it, they will not be interested to go back to that area. 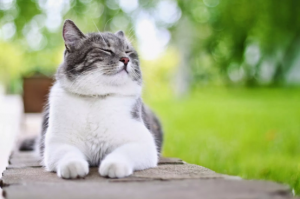 The essential oils like lavender, citronella, lemongrass, and peppermint are also effective cat repellent when mixed with water. The texture of sandpaper and aluminum foil are different, and the cat doesn’t want to step on that kind of texture. Therefore, if you wrap the legs of the furniture by these things, their paws will feel different and they will not scratch it anymore. If you think putting a sandpaper or aluminum foil in the legs of your furniture will destroy its view, then try to paint it with a similar color to the furniture. The texture will stay the same anyway. Cats don’t want sticky surfaces. So, if you put double-sided tapes to the top of the cabinets where they usually jump on, they avoid it and never jump into that area again. They don’t want sticky surfaces because they can not tolerate the feeling on their paws. You can also spray mixture here if you don’t have a double-sided tape. Simply put water in the spray bottle. Then if you saw your cat to be in that area you don’t want them to go, spray them a little bit of water and they will run. Because cats don’t really want to get wet. It has no scent that will last in that area but if you repeatedly do it, the cat will be trained that if they go to that area, they will frequently get wet. Preventing your cat from popping in the yard is not easy because we don’t know when they are popping. So, for them to prevent popping there, you have to scatter orange or lemon peels to the yard where you don’t want them to pop. The cats don’t like the smell of citrus and this will be the reason for them to stay away. Plants like lavender and Rosemarie produces scents which are not pleasant to the cats. So, if you want to have a garden but cats keep on destroying it. Try to plant lavender and Rosemarie. Aside from those plants, there are more plants that the cat doesn’t want the smell. Which will be the reason for the cat to stay away from your garden. Cats love to play in a place where it is clean and wide. They run on it or dig in it. Therefore, if you put and scatter plastic forks around your plants. The cat will not be interested to play in that area. Because it is a hassle for them to avoid the forks going to that area. Those are the things that will help you control and prevent your cat from the annoying things they usually do. Doing those simple things for them is not only for your own good but also for them. It is a way to train them. Having a pet will require you a ton of understanding and patience. Because they don’t know if what they are doing is good or bad. So, we have to think of another way to prevent them to be a bad pet. A cat and a bath? It sounds incompatible right? As we know, cats really hate even the tiny drops of water splashing through her body. But for some owners, they showered their cats to make them cool and refreshing. A domestic cat really hates getting bathe. For some reason, domestic cats have a coat that absorbs rather than deflects moisture which makes it harder for them to dry up after they got soaked in water. So bathing a cat in water is a little bit challenging. Does the cat need to bath? Obviously, when your own cat has soiled themselves in a litter box, you will have to bathe the cat to cleanse them up. And for your information, cats are automatically grooming and cleaning themselves. When you think that a wipe-down with a damp washcloth is not enough for your cat, prior for the better cleansing up, you tend to make them soaked in water. It is normally that a cat get stinks and you can’t stand their disgusting smell cause by garbage or any trash. I’m sure that you don’t also want your house filled with dirty paws marks. This one situation is enough for you to have your cat a bath. It may seems not that easy, but for your own sake and safety, the cat needs to be clean up. This is very important when attempting to bath your cats. Keep in mind that you should observe first how well they behave when they get soaked in water. But for those who are unsure of what will be their cat’s reaction, like freaking out and you think you will not handle the situation, seek first for the veterinarians. They can be of great help and may provide you the necessities and give you an advice of how to bath your cat. If you don’t want to get injured by your cat, you can also choose to take your cat to a groomer. Make sure that you have a recommendation for a groomer that uses humane ad gentle handling techniques. But before doing so, visit first the grooming site to see if you are comfortable with the surroundings, handling techniques and cleanliness of the surroundings. Washing and bathing a cat can sometimes be a handful and tough. Knowing that they don’t want to get splashed by water, it is really hard to do this task. Large pitcher for rinsing or a spray nozzle. Cat shampoos are readily available at the pet stores or even in the supermarkets. Make sure that the shampoo you are using is specifically formulated for cats. Many veterinarians have recommended a Virbac which is a good brand of shampoo for cats. This shampoo is also good when it comes to medications, antibacterial varieties and is also hypoallergenic. Make sure that you don’t use any kinds of cleaning products because it may result to your cat’s eyes and skin get irritation. You can use a mild baby shampoo if you don’t have any cat shampoo. The sink should be filled at least 2-3 inches of lukewarm water. You need lukewarm water to make them not freak out and that they would feel relaxed and comfortable. You can now wet the cat from the shoulder to the tail and then apply shampoo. Lather and rinse the cat thoroughly and thought of it just like your own hair. This step should be done with care as your cat may freak out when you touch their tails. Make sure that you should not put any bubbles of shampoo in their eyes and face. We know that cats really hate having water splashed to their face, so you just need to damp their face with washcloth gently to wipe off dirt and to cleanse their head. After cleansing his head, aim now for their ears. Cleanse their ear by a cotton ball and never put any kind of objects inside your cat’s ears. 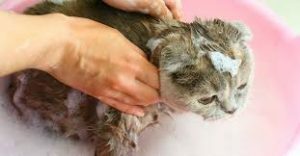 After shampooing and cleansing the cat, lift them up to the sink and wrap the large towel around their body. You should rub off water from their fur gently and as much as possible. If you have any blower, use it to make their fur gets dry easier. But make sure that the blower will not terrify your cat. The blower is mostly used for those cats that have thick hair and is not easy to dry their hair. Giving a bath to your cat must be done with extra care if you are especially new to the task. Have some people to accompany you if you still doubt yourself. There are actually many ways on how to bathe your cat. There are groomers that specialize in this kind of thing and veterinarians that can help you providing things you’ll need the most. Have also some research on how to do things accurately, precise and thoroughly in taking care of your cat. It is best to bath your cat for a short period of time and as quickly and efficiently as possible!